Wondering if now is a good time to invest in precious metals? Yesterday, the Dow Jones Industrial Average jumped to a record Tuesday, finally surpassing its previous high set in 2007. 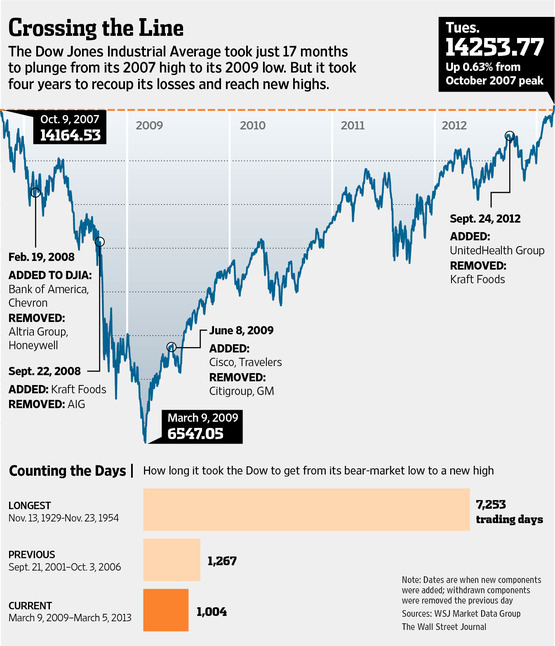 It took 17 months to plunge from its 2007 high to its 2009 low, however it took four years to recoup its losses and finally reach above the previous high. Individuals looking to roll over their retirement accounts into Gold could now be looking at one of the best values since the previous high. Gold priced according to the Dow can buy you more than ever. Individuals looking to be add value to their retirement should consider adding precious metals to your IRA. American Bullion specializes in adding gold and silver to retirement accounts. If you have a question or would like to know more about your investment options, please call1-800-326-9598 to speak with a precious metals specialist. American Bullion and it’s agents are not registered or licensed by any government agencies and are not financial or tax advisors.